@pistachio: Really loving those sketches! I highly recommend doing daily sets of 30 second sketches. @Mush: very nice! 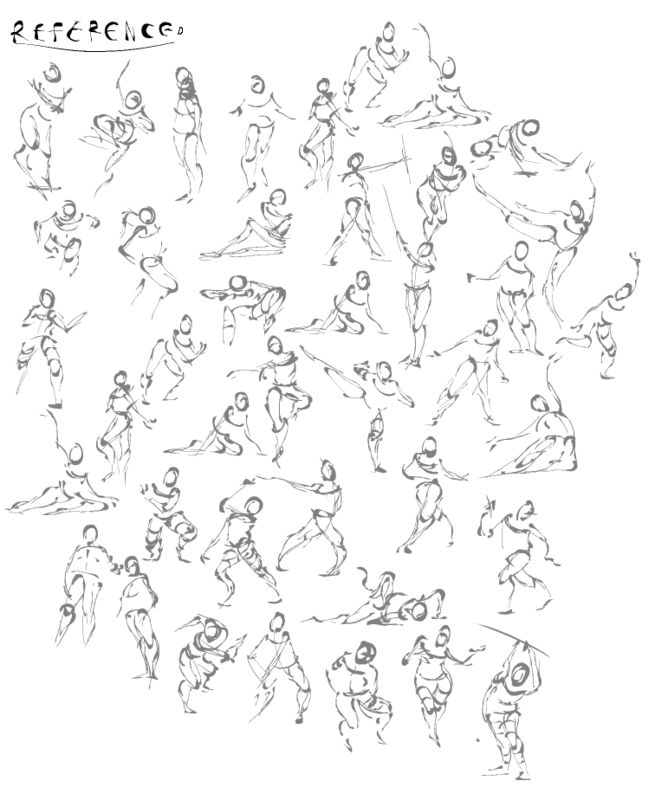 Try doing gesture sketches to fix stiffness. Gesture before structure. Been really loving backs lately (kind of a weird thing to say?? ), so have done a couple of studies on that. Have learned a tonne just with these two drawings. Will probably make the second drawing a daily task until I really have it locked in my mind. 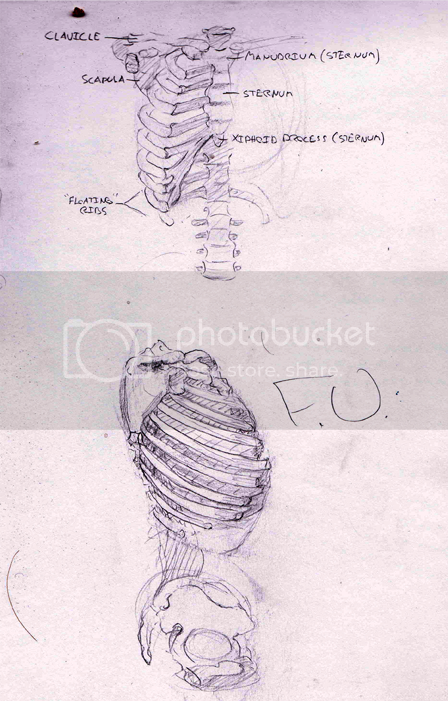 Enjoying anatomy quite a bit! Shall post more in the immediate future. Long live the anatomy guild. 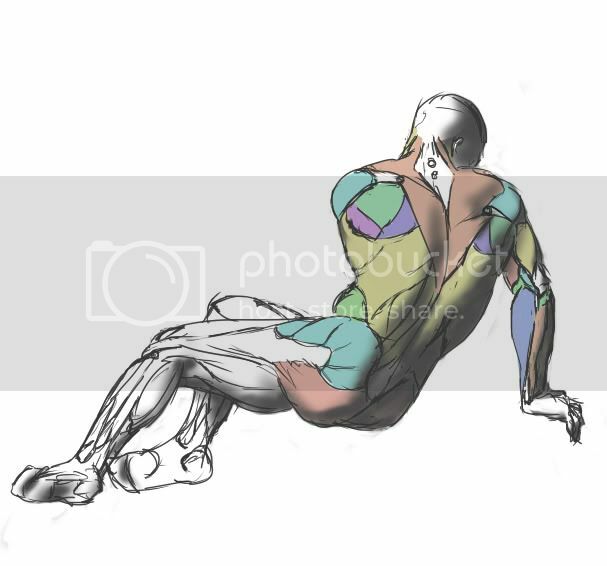 I was going to post this to the creativity thread but as this one doesn't explicitly say "human" anatomy I figured it would go here. Oh yes, learning animal anatomy is EXTREMELY helpful. Regarding the Panzerwurm, try to remember that mother nature is obsessed with efficiency. If the animal can get away with not having something, evolution will direct its resources to something else. 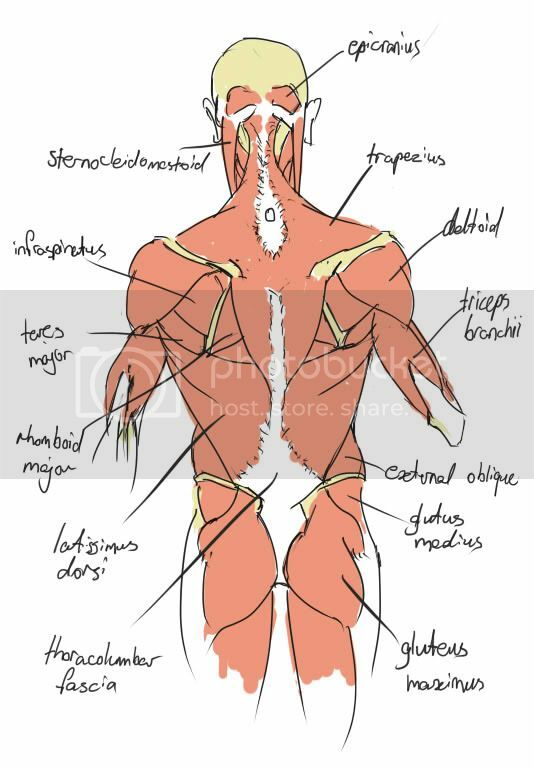 Consider the roles of the following: the rib cage is a flexible shield around the organs, the plates a kind of inflexible extremely heavy armour, the spikes a repellent defense. Does the animal need all three? Think about how much bone that is, bone is kind of costly to grow. If you remove the most expensive and redundant element, the heavy plates, it seems much, much more realistic, in my mind. A similar question could be asked of the legs; does it really need 6? Could it get away with 4? Dinosaurs got away with 4, even 2, despite their immense size. I don't know if the bone structure of the fore-legs really fits their role. The animal is basically going to be walking around on them at all times; their role is as a structural support. The arrangement you have now is more for accomodating a lot of twisting, something more appropriate for manipulators like arms. Look at how much stronger the back leg is, how much better it serves its role as a support. That's all I've got for that. Definitely check out some dinosaur stuff. 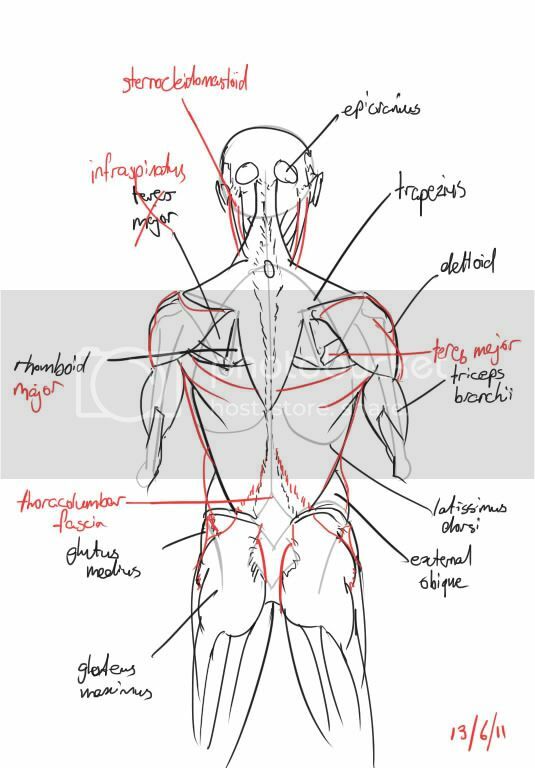 Trying to recall all the back anatomy stuff without reference. Stuff in red are MISTAKES. 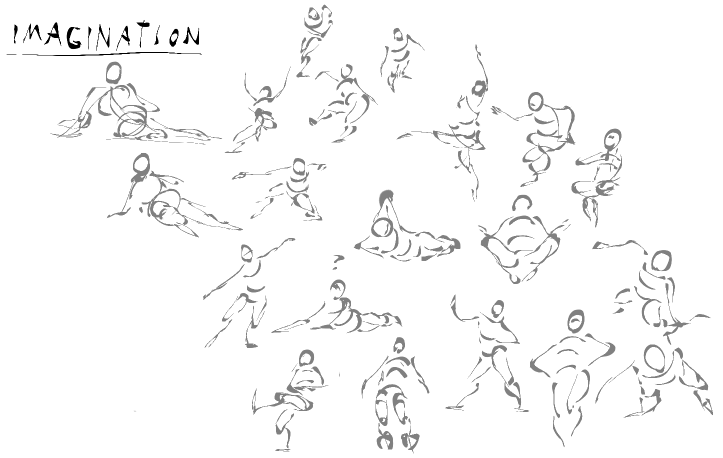 I've also been doing at least an A2 page of 30 second gesture drawings per day on traditional media. Really helping me with lines and speed. Still a loooong way to go, though. As for too much bone structure: I might be able to get rid of the ribcages and the horns on the back but I can't give up the bone plates because they are basically the one thing which make Panzerwurm Panzerwurm (Panzer == tank/armor, wurm == worm). To accomodate for the loss of the spikes on the back I think I'll change the tail and put something along the lines of Stegosaurus or Dyoplosaurs at its end. As far as twisting and flexibility is concerned: I want that! Panzerwurm is supposed to be agile and flexible while still being armored. On the legs: Technically he has only two legs in the back, the four other things are arms and I even thought about giving him an opposable thumb on each hand so he could get some real work done and maybe even learn to draw and code someday or make guns to kill off his fellow Panzerwürmer. Imagine the possibilities, he could shoot four pistols at once... how cool would that look in slow-motion? On the strength of the legs/supporting role for walking around: I'll look into moving the two arm pairs further to the front and raising the legs and making them even stronger (think Stegosaurus) and then the two arm pairs should be support enough in the front. 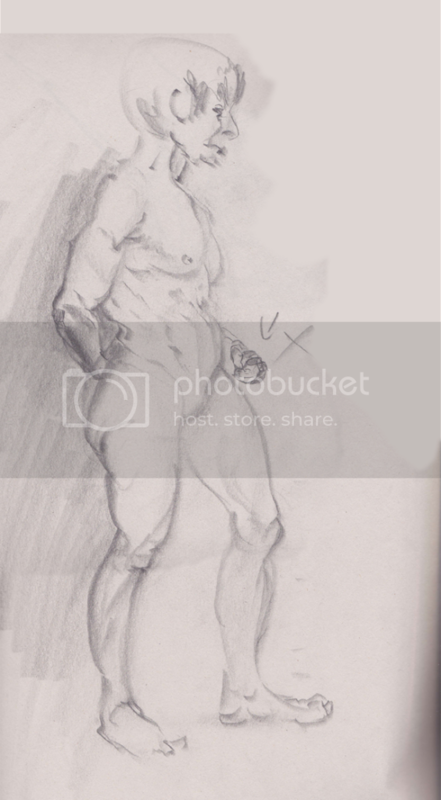 I'll have to trade a little of the anatomical believability for possibilities (what he can/can't do/how he survives/etc.) and to keep the creatures main identifying features intact. EyeCraft, those hands are looking pretty good, and you seem to be using crosshatching pretty well in terms of conveying shades of light (something seems a bit off about the pinky though). 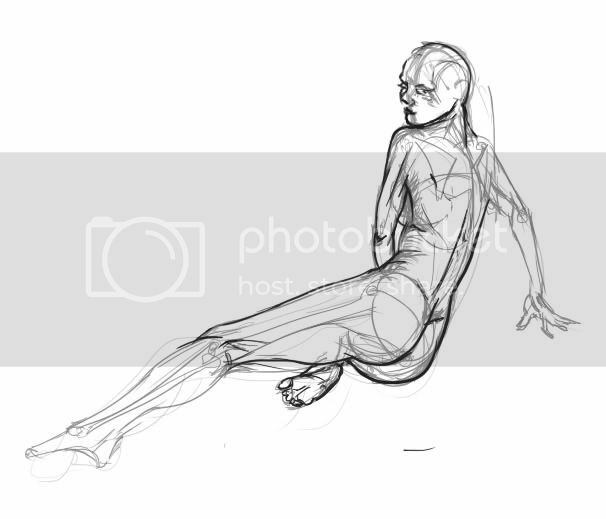 The figure drawing's torso seems a bit stretched though, and her right arm seems to be placed in a rather odd position considering it's the arm that's holding up her weight. Also keep in mind the curve of the spine. It's unnaturally straight right now even in the position it's in. Now on to me; just finished two pages of gestures for the ConceptArt Spartan Camp, the 190th to be precise. No, I haven't been doing this 190 times, of course. But have you heard of it? 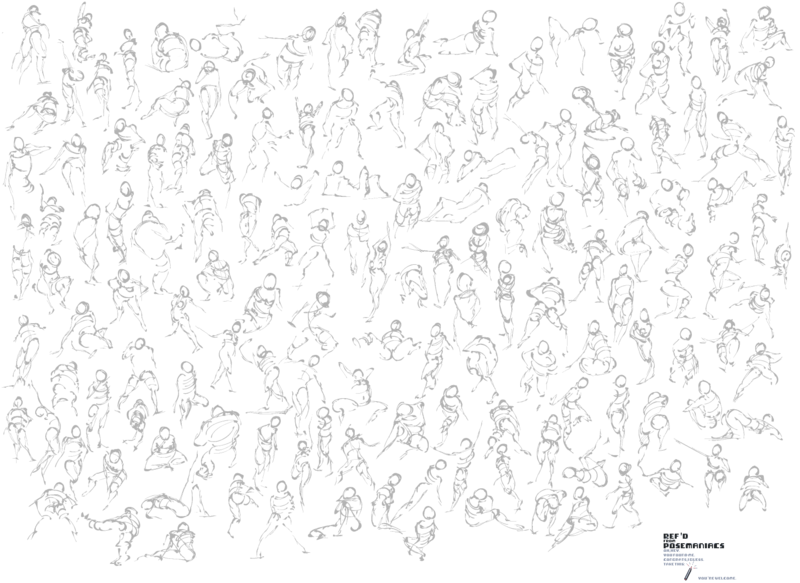 Basically a group-centered thing where people gather round and submit pages of gesture drawings before a deadline. I've been stalking them since about #170 but only started doing it now. Anyhow, I feel I've improved quite a bit since the last time, having taken up studying Bridgman and Loomis (mostly Bridgman). I've become particularly interested in this book, essentially taking the route of traditional construction, but finally brought down to a level where I find it easier. The drawings are under links. This one's imagined, a few from memory. This one's referenced, from that pixelovely gesture thingy of course. @EyeCraft, well yeh, there is a limit on them in a way. I set the gesture tool to "30 seconds" and then just drew away. I found they often took less time than that, about 15 - 20 seconds (as opposed to the last one I posted, where most of them, I feel, remain "unfinished" because I was having a hard time with the limit--no longer! ), so I just skipped to the next image when I was done; I suppose the limit's not actually that strict. Occasionally I would cheat and pause, then resume to the next image when finished. This was usually when my hand needed a rest, so I could draw slowly and not have to worry about rushing. As for the line weights, I agree, I probably got a little too carried away with pen pressure especially on the imagined ones. The brush I was using also exaggerated it a bit, but I shouldn't blame most of my problems on it. Well great, look forward to seeing you there sometime! At the camp. You'll probably know me when you see me, I have the same gestures posted over there. pistachio: Yes, I highly recommend that book, I have found it to be excellent. Very logical and adaptable. Is there a time restriction on your gestures (like 30 or 60 seconds), or are they unbounded? I find them to be quite good. 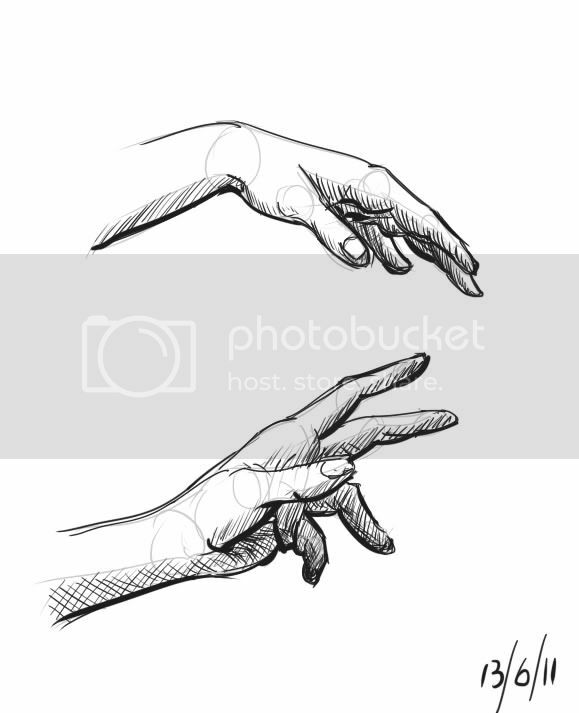 I have a problem of being too concerned with contours, proportions and specific structures when working with gesture. I think I'm slowly weeding that out though, but you seem to have a great level of abstraction. The line weights seem a little odd though, they get super fat in some places without really communicating anything (to me, anyway). As for you critiques, I shall do a detailed double check against the reference. To be clear, the dark line running up her back is not her spine, but a muscle (that I don't know the name of!!! ). The spine is only slightly indicated by the couple of very slight shadow lines to the right of that straight line (she has a very pronounced bumpiness to her spine). Spartan Camp sounds cool, SHALL CHECK OUT. Thanks, EyeCraft. Will take that into account. Her spine, the "shadow" lines you were talking about, does seem a bit straight still. But I suppose it's just my nitpicking. Either way, I'm sure you probably knew about the curve of the spine by then. Extra large to make up for lost time. It's over at the Spartan Camp too. 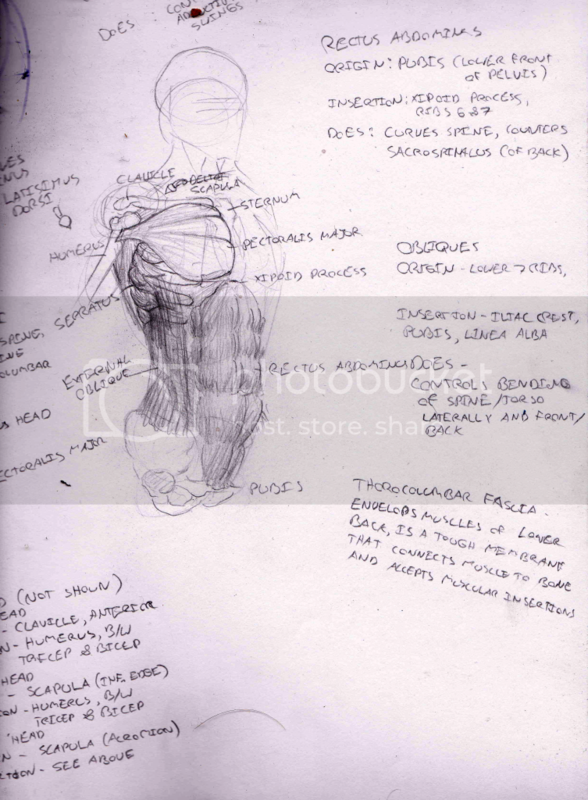 Nice overview of female anatomy.